Snyders, Frans (1570 Antwerp 1657). Two young lions pursuing a roebuck. Chalk lithograph by Ferdinand Piloty (Homburg, Saar Palatinate, 1786 – Munich 1844) printed with yellowish and ocher-hued tone plates. (1816.) Inscribed: f. Snyders pinx: / f. Pilotj del. 15½ × 21½ in (39.3 × 54.7 cm). Winkler, Die Frühzeit der dt. Lithographie, 622/25, II (of IV and V resp.) + 954, 16. – Cf. Robels, Frans Snyders, Munich 1989, no. 259 with ills. as well as ASK 1.I ff., pp. 92 ff., p. 150, para. 1; Koslow, Frans Snyders, Antwerp 1995, pp. 287 (full-paged colour ills.) + 302; Sutton (ed. ), The Age of Rubens, Boston 1993, no. 120 with colour ills. + Hantschmann, Nymphenburger Porzellan, Munich 1996, pp. 314, no. 25 + 354, no. 70 and ills. p. 358. Incunabulum of lithography . – The 2nd state shining thanks to its additional yellow before the removal of also the “del:” which is visible here like its “f.” – contrary to Snyders’ signature – in traces only within the as a whole feeble Piloty signature. – The 1st state in black only, the 3rd (our 13,367) with ochre printed over, the 4th just with subdued chamois tone plate with simultaneous removal of the framing line. Later Piloty & Loehle published an enlarged detail of the lions only under the title “The Young Lions”. – Watermark M(anufacture) de I. A. Huber. The long, last by Robels also in regard of the thematically special position, assumed original pendantship to the “Lioness striking a Wild Boar” in Munich, too, (Winkler 622/24; for the motif in expressionist new setting see Heckendorf’s painting here) is doubted by Sutton (p. 565) with reference to the 9 cm piecing on in the lower margin of this motif presumably made by later hand only to approximate the formats. Here reproduced in reverse the buck is placed on the left and leaping to the left though turning back to the lions. 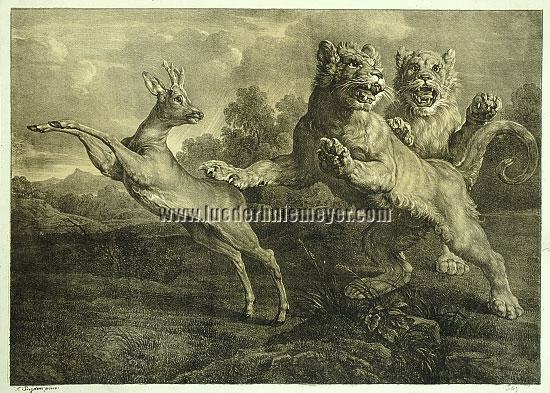 All three reared on their hind legs, the paws of the front lion, while he looks back to the right at the jealous rival looking out of the picture, reach into space, at best the right just grazes the buck. The spacious, “far seen” (Bernt) ambience with a distant mountain – here on the left – supposedly by Jan Wildens (1586-1653, see Robels 259 and additionally pp. 147 f.). In the absence of signature Oldenbourg (1918) + Manneback (1949) meant the lions could be by Rubens himself. In 1983 the Munich inventory is the opinion that an unknown Rubens drawing only stood sponsor. Corresponding herewith Balis (1986) judges the homogeneous pair within the etched set “Variae Leonum Icones” by Abraham Blooteling (1640-1690) after Rubens as just copied after Snyders’ painting. Nevertheless the lion placed back were based upon the jumping lioness of Rubens’ “Lion Hunting” formerly in Bordeaux, while the attitude of the other were reminding of the dominating wolf of the New York oil “Wolf and Fox Hunting” worked by Rubens and his studio. Additionally he appears in Snyders’ “The Lion and the Mouse” of the same time in Chequers and as a variant in Madrid (Robels 210 + 212 with ills.). Irrespective of the static leap posture artistically exciting composition to which in the view here just the brownish tone of the early years “difficult to reveal” for Winkler (p. 13. col. 2) imparts that pictorially quite extraordinary fascination, multiplied by the room-filling, marvelous landscape decoration. (Winkler, at the same time deploring that especially the large and scenic sheets were and are “downright ‘used up’ as wall decoration”). With 18 × 25¼ in (45.8 × 64 cm) almost corresponding to the sheet size of about 18½ × 25⅝ in (47 × 65 cm) Winkler reports for the set and by this with fine wide margins of 3-4.5 cm and also otherwise of quite excellent condition.